Tranquility on the Daintree is a private retreat and is more than just Daintree accommodation. Tranquility on the Daintree is indeed your ideal Daintree holiday destination. Nestled in the upper reaches of the historic Daintree Valley under the watchful gaze of Thornton’s Peak, one of the highest mountains in Queensland, and just 9 kilometers from the quaint village of Daintree, a jewel awaits you. Set on a secluded 450 acre private property, Tranquility on the Daintree is more than just accommodation - it is an exclusive self contained accommodation experience that allows you to experience everything the Daintree has to offer….naturally! An ideal wedding location – imagine an intimate ceremony in front of the spectacular Niau Falls, surrounded by tropical rainforest. 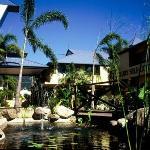 Then, honeymoon at Tranquility on the Daintree, a romantic secluded piece of paradise. The perfect way to start your life together! Leave the city and people behind, relax and enjoy the essence of the Daintree in this tropical paradise. Pure living, pure air, pure water! Tranquility on the Daintree offers spectacular 360 degree views over lush farmland, the beautiful Daintree River, picturesque mountains and the World’s oldest living tropical rainforest. Explore your own private exotic tropical fruit gardens, savour the flavours of fruit in season and picnic and swim at your own private rainforest waterfalls – yours to discover! Really want to relax? Why not experience a one hour massage at your choice of location. Imagine the sensations as you enjoy a full body massage in the World’s oldest rainforest or in front of the magnificent Niau Falls. The ultimate indulgence!